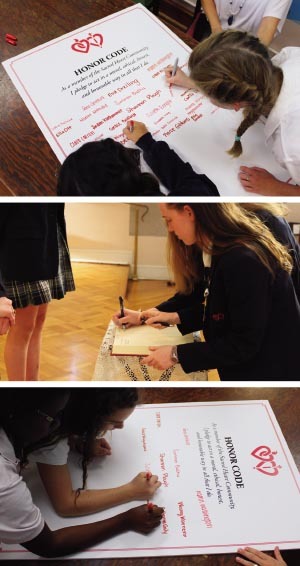 In all their endeavors, Sacred Heart students must strive to act with integrity. Students are encouraged to make wise, responsible, and ethical choices and to accept the consequences of their choices, both good and bad. Students are also encouraged to reflect upon how their choices and the choices of their peers impact other students, the school community, and the wider community. The Honor Code of the Academy of the Sacred Heart is based on the premise that students are taught to value honesty and integrity. Honorable behavior and honesty form the foundation of respect for oneself and for others. Sacred Heart students are responsible for vigorously upholding the ideals stated in the Goals and Criteria for Sacred Heart Schools in the United States. "As a member of the Sacred Heart Community, I pledge to act in a moral, ethical, honest, and honorable way in all that I do." Want to be an Honor Council Member? Ask us.